Well respected in the international graffiti scene for both his letters as well as his famous street art character BunnyKitty, Persue often noticed Wet Paint signs while waiting for the subway. These signs, with their bold red letters, were instantly recognizable yet often ignored as a benign part of the urban scenery. He later realized that these signs were made specifically for the New York City subway system, which elevated them in his eyes, to an iconic piece of the setting where New York’s graffiti movement was born and thrived. In his Wet Paint practice, Persue (and his collaborators) utilize the iconic sign as a canvas, and studies their interaction with graffiti. 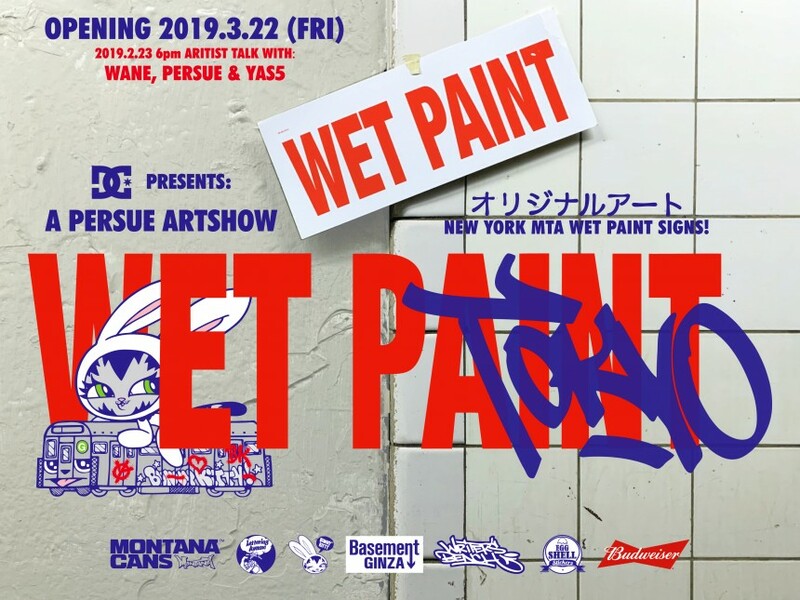 Following on from shows in NYC and Miami, the Tokyo exhibition at Basement Ginza features artwork from a host of Wet Paint artists and a pop-up shop from Tokyo-based paint shop Lettering Avenue with limited edition goods for sale. There will be an opening reception on Friday March 22 (6pm — 9pm) and an artist talk with Persue, Wane and YAS 5 on Saturday March 23 (from 6pm).